The Lady in the Tower by Alison Weir bears the subtitle “The Fall of Anne Boleyn”, which tells you just about everything you need to know about the book. Assuming you know Alison Weir is a historian, you will then be able to surmise that this is a historical study of the last months and days of the life of Anne Boleyn, Henry VIIIs second queen. Henry VIII became infatuated with Anne while he was still married to Katherine of Aragon. For six long years she kept him obsessed with her, refusing to sleep with him until they were married. Finally he broke with Rome in order to take over as Supreme Head of the Church of England, and therefore set Katherine aside and marry Anne. But by the beginning of 1536, Anne had still not given birth to Henrys longed-for male heir, and Henry, having finally got what he wanted in marrying Anne, had realised that she wasn’t the queen he had hoped for. By May 1536, Anne was accused of adultery and therefore treason, and executed at the Tower of London. The Lady in the Tower is Weir’s study of those final, fateful months. The story of Anne Boleyn is a well-told one, and her name generally evokes powerful opinions, whether for or against her. Through much of history she has been viewed as a manipulative adulterer, and one of the “bad guys” of the Tudor period. But is this reputation truly deserved, or was Anne a victim of those who resented her rise to power and her influence over the king? Despite my interest in the Tudor period, Anne’s story is not one I have paid a great deal of attention to before now. She wasn’t a character that I found particularly enthralling. I had formed a fairly general opinion that her reputation was deserved, and that Henry VIII was better off without her – and that he made a gross mistake in casting aside Katherine of Aragon for this she-devil. But as always, Weir has made me re-examine my preconceptions. Weirs style in The Lady in the Tower remains constant with her other works. She writes well, smoothly and authoritatively, yet her work is always accessible. As with previous works, The Lady in the Tower is highly readable, and never a dry history tome. It is as addictive and unputdownable as a well-written novel, proving that history is as exciting as anything that can be made up. Weir presents her account of Anne’s final days as an investigation, which indeed it is. She takes all the evidence, recounting the facts where available and building conclusions where fact is not known. However, unlike other historians, Weir does not present her opinion to us as fact. She examines all evidence, presents all possible options, and then gives us the most likely or plausible conclusion. Yet we are never told that this conclusion is what happened – Weir always makes it clear that this is not certain, that it is assumption only, no matter how likely. We, the readers, are left to make our own decision as to whether we agree with Weir’s conclusions; I usually find that I do accept her conclusions, for the simple reason that her investigation is so thorough that she always reaches the most logical conclusion. This thorough investigation is no surprise: being familiar with Weir’s work, I expected no less from The Lady in the Tower. What has remained with me from my reading of the book is my changed feelings about Anne Boleyn. Not only do I now suspect she was probably innocent of the charges brought against her (although I still think she was a manipulative and probably unpleasant so-and-so), but I find I am keen to learn more about her. Weir’s account is an exceptionally detailed one, but there is always more to learn, and I intend to continue my reading on Anne Boleyn. 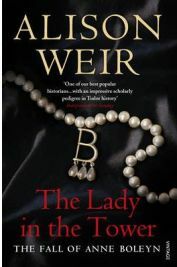 As always with Weir’s work, I highly recommend The Lady in the Tower. It is readable and utterly compelling, a sad yet fascinating account of the final days of one of England’s most controversial historical figures. No Comments on "The Lady in the Tower"